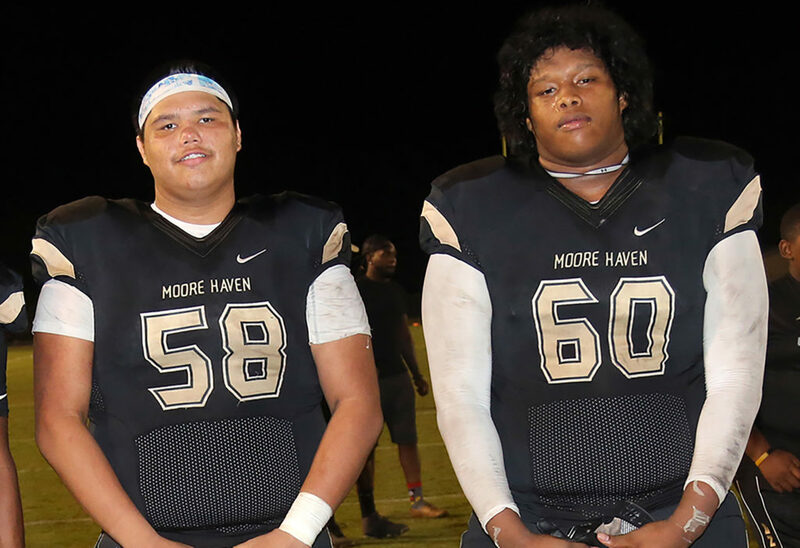 MOORE HAVEN – As towering linemen on the football field, Robert Harris and Andrew Fish are tough to miss on Friday nights in the fall. Harris is 6-foot-6, 320 pounds; Fish is 6-4, also 320 pounds. But this spring the large duo from the Brighton Reservation made their presence felt elsewhere. Harris and Fish, who helped Moore Haven High School’s football team produce an undefeated regular season in 2017, showed their athletic abilities in shot put for the Terriers’ track and field team. Both athletes qualified for the Class 1A state championship May 5 at the University of North Florida in Jacksonville, and they were the only two athletes from Moore Haven to do so. In order to reach states, Harris and Fish needed strong performances in the preceding weeks at districts and regionals. Up first was the Class 1A-District 8 on April 17 at St. John Neumann Catholic High School in Naples. Harris, a sophomore, won the shot put title and Fish, a junior, finished a close third. Harris heaved the shot put ball 42 feet, 11 inches while Fish’s hurl went 40 feet, 11 inches. Both performances helped the Moore Haven boys team finish seventh. A week later at the 1A-Region 2 championship at Cypress Creek High in Wesley Chapel, both Harris and Fish surpassed their throws at districts and finished in the top four out of 16 competitors. Harris missed winning a regional title by a fraction. He finished runner-up at 44-05 while champion Marterrian Davis of Wildwood High School near Orlando won the title at 44-08. Fish finished fourth at 42-08. For the state finals, Harris was seeded eighth and Fish was seeded 19th out of 23 competitors from throughout the state in Class 1A. Both finished in the top 15. Harris’s throw of 43-02 was good enough for 11th; Fish finished 15th with a throw of 42-00. State champion Taquan Brown of Victory Christian Academy-Lakeland launched a winning throw of 50-06. Harris was the top sophomore out of the five sophomores in the 1A state final. Both players and the rest of the Terriers football team will be back on the football field in the coming months. The games start Aug. 17 at Marco Island Academy.